I was recently gifted some gorgeous body care products from a brand called Ayumi. I hadn't come across the brand before and as I have been so impressed with their products, I wanted to share my thoughts with you. Ayumi was created by a family-owned business called Fudco, who are also one of the leading brands and suppliers in the ethnic food market. 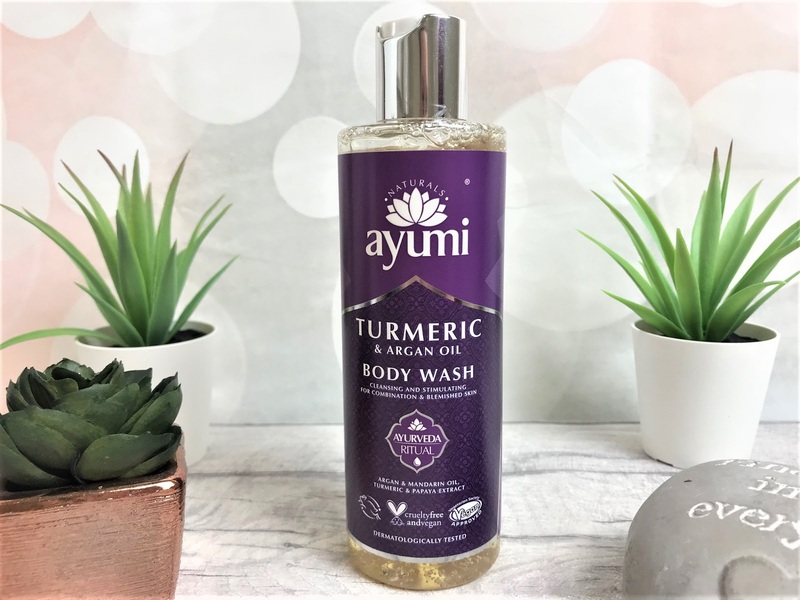 Ayurvedic's principles have been around for years, but as there were no beauty ranges that combined its ancient holistic benefits with quality and compliance on safety, Fudco created Ayumi. The brand's range of hair, body and skin products are designed to pamper, replenish, nourish and protect from the rigours of modern-day living. Fragrances and formulations were selected for their individual strengths - calming rose, soothing sandalwood, healing turmeric and purifying neem amongst others. The first product I tried out was the Ayumi Turmeric & Argan Oil Body Wash (£6.99). This is perfect for dry and dehydrated skin, which I currently have due to the cold weather and is infused with brightening botanicals to enhance vitality and uplift lack-lustre skin. The packaging is quite simple but looks more upmarket than your regular body washes and the scent is divine - it reminds me of being in a spa, and allows me my own little sanctuary in the comfort of my own bathroom. This body wash is packed with natural Ayurvedic herbs and botanical extracts and contains restoring liquorice which helps to prevent age spots. I found that this didn't dry my skin out whatsoever, and kept my skin well nourished and soft throughout the day. Ayumi products are dermatologically tested as well as being vegan and Peta approved - Ayumi do not test on animals. After my bath, I then massaged in some of the Ayumi Turmeric & Shea Butter Body Lotion (£6.99). The packaging matches, so you could also make these into a really lovely gift set and at just £6.99 for a high-quality body lotion, the value is incredible. The body lotion is luxurious without being too thick and it sinks into my skin instantaneously, so there is no hanging around waiting for it to dry before getting dressed, which is a major plus for me, especially in this cold weather. 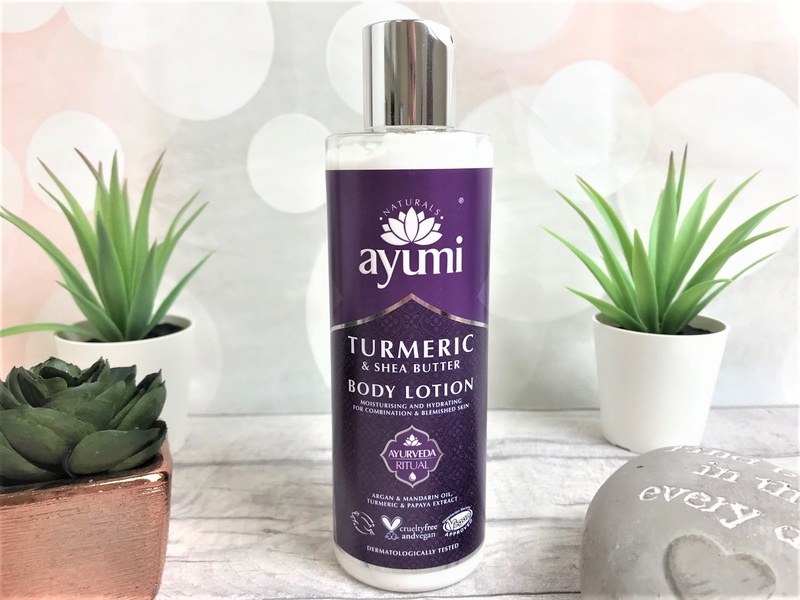 The Ayumi Body Lotion helps to lock in moisture and help skin to retain its natural glow. Ingredients-wise, it includes turmeric which is known to improve skin tone, Babussa and Argan Oil to restore suppleness, Sweet Almond Oil to moisturise and Papaya to reduce scarring. I have quite a number of scars due to surgery for my severe endometriosis, and I have been concentrating on using this particularly in those areas, and I have already noticed them becoming softer and less noticeable. 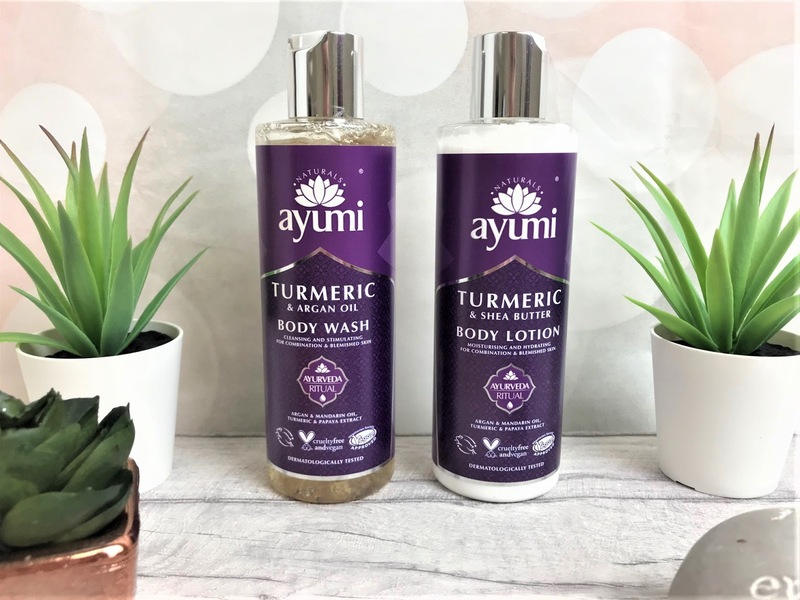 As mentioned, Ayumi produce skin care, body care and hair care, but you can also purchase essential oils which have endless health benefits too. You can find Ayumi online here.